As of this writing (August 2018), Infinity Futures does not officially support the 64-bit version of Sierra Chart. You may find there are DLLs that have not been built for the 64-bit version, and they will break. (All of the DLLs from Forgiving Computers come in both flavors.) However, you can still try it out and see if everything works without causing any problems. If you want to run the 64-bit version, here is what you need to do. The first one is the 32-bit version, the second is the 64-bit version. The 64-bit version is larger than the 32-bit one. If you want to run the 64-bit version you need close Sierra Chart if not already closed. Then rename the first one to something like sierrachart_32.exe. Then rename the second one to sierrachart.exe. You will then be able to start Sierra through the Infinity application, and it will come up as 64 bit. You can confirm this in Help About. If you want to switch back to 32-bit rename sierrachart.exe to sierrachart_64.exe and rename sierrachart_32.exe to sierrachart.exe. Save the file as Sierra_64.cmd in the C:\SierraChart\SierraChartTransActMA folder. Now when you want to switch to 64 bits, close Sierra run sierra_64.cmd. To switch back run sierra_32.cmd. Note that when you update Sierra Chart to a new version, it will overwrite both the files, and you will be back on the 32 bit version the next time you open the application. Just switch back to 32 bit before updating, just rename them again. If you forgot to do this, you can rerun the sierra_64.cmd file. Are these different Cht’s than the ones I have? I get Sierra through Infinity at this time. Will I be charged an ongoing fee? At the moment, the charts are basically the same. I will not be updating the ones you have with new features, but they will continue to work. If you decide to purchase a V3 subscription, there will be an ongoing charge after the first month, which is free. There will be no change to your Infinity account. Sierra provides a way to license software to users with the Sierra Account Name. I want to put an NQ long alert into the T3 strategy, but the description and the number of the study don’t match the member video about Alerts now. What study number to use for the alert or where to put it in the current T3 auto study setting? The S3 auto trade study is ID5, the T3 auto trade study is ID16, and the W3 auto trade study is ID3. 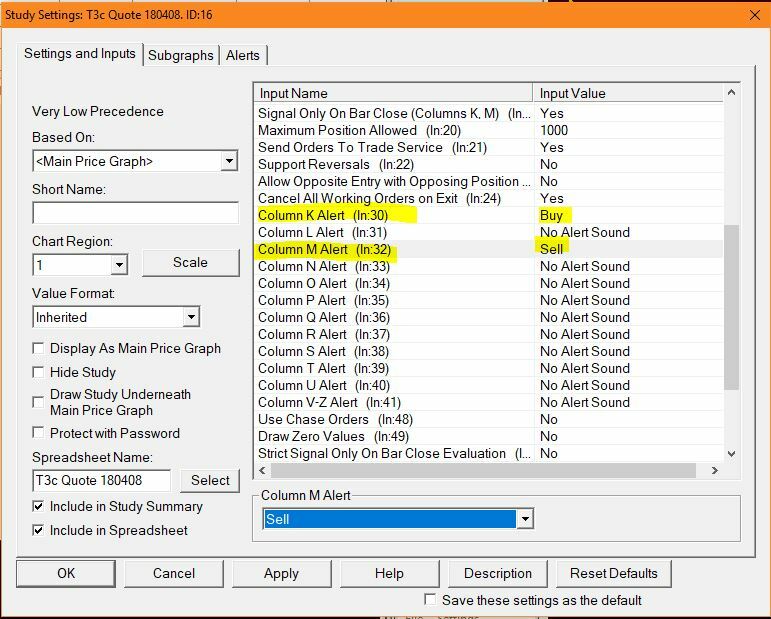 For example, you can add an audio alert to the T3 Auto Trade study by editing the Study Settings for ID16. Column K is Buy Long, and Column M is Sell Short. If you want to add sound files to the list of available alerts, the files should be saved in the C:\SierraChart\AlertSounds. (For Infinity/Transact Futures the folder is: C:\SierraChart\SierraChartTransActMA\AlertSounds.) Go to Global Settings>>General Settings>>Alerts/General 3 to add sound files to the list of available audio alerts. Can changing memory chips speed up my computer? Dell wants to sell me new memory chips to help speed up computer processing, not sure that will do it. Unless the computer came with slower chips than it was designed for, swapping out faster ones will not make a difference. I don’t think Dell would have done that. What will help is if you upgrade to more RAM, as Windows will spend less time swapping data back and forth to the disk drive. You can go to Crucial.com and run a test that will tell you what your options are. Dell will sell computers with less than the maximum amount of RAM allowed to save money. The best way to speed up Sierra Chart is to use a SSD (Solid State Drive) as your drive for Windows and Sierra Chart. Also reducing the amount of data/days that the chart loads on start up of the application will help. If you don’t normally run backtests or look back on your charts more than 7 days.There is really no need to have your charts set to load more than 10 days of data. Is there any way to change the Daily PL cutoff time? 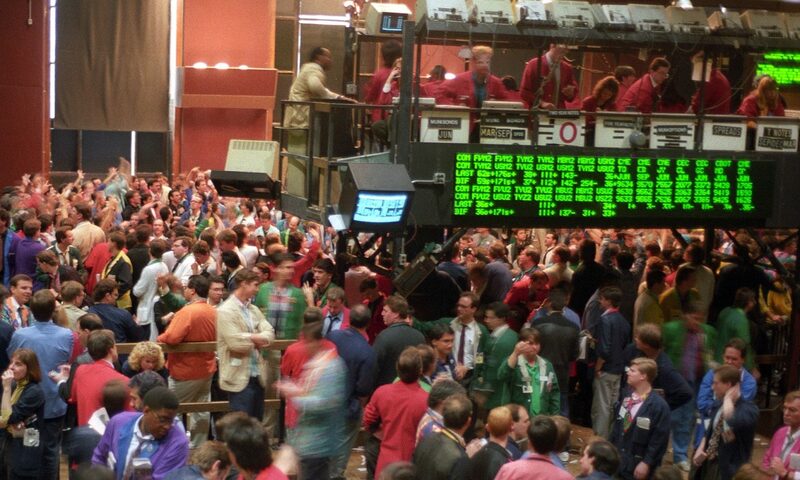 Technically, the trading day begins at 18:00 EST. Yes. By default it resets at midnight according to the Time Zone setting in Sierra Chart. The reset time can be changed through Global Settings >> General Trade Settings >> Daily Stats Reset Time. I get “Symbol is Unknown. Click for Symbol Information”. Your trade service uses different symbols than the ones that have been provided. Go into Chart Settings, Main Settings and select the FIND button next to the Symbol: box. You can search for the correct symbol or if you know it, just type it into the Symbol: box. For example, if the chart settings are using the symbol NQM8, and it is listed as Unknown, you may have to enter something like F.US.ENQM18 if you use AMP as a broker. When I close the chartbook, I get a dialog that says: “Save spreadsheet xxxxxxx.scss?” Should I save it or not? In general, no. You only need to save the spreadsheet if you made changes to it, and haven’t saved it yet. Nothing needs to be changed in the spreadsheets. Otherwise you can say No. Changing the values in the Constants Study does not count as changing the Spreadsheet, as they will be reloaded the next time the chartbook is opened. What do I do if there are no arrows? For S3 V1.0: Check that the time is correct for the chart (RTH or Globex). For all S3 and T3: Try closing the chartbook and reloading it. Try restarting Sierra Chart and reloading. Make sure the Spreadsheet study is not hidden. Try extracting the original files from the zip file again. Can I auto trade some charts and not others? Charts that do not auto trade will work as they normally would. Auto Trade charts can be individually disabled by Unchecking Trade> Auto Trading Enabled – Chart (or using the ATC button) for each chart you don’t want auto traded. While it is supported to have multiple charts auto trade the same symbol, it is not recommended, as you may undesired results. Can I manually trade based on the Auto-Trade signals? Yes. You can always use the manual trading controls. At no time are they disabled. That includes managing the trade stops and targets. I see the auto trade arrow, but there was no trade entered. – Live Money (Or Live SIM Server): Send Orders to Trade Service is YES in the Auto Trade study settings, and Trade Simulation Mode on is UNCHECKED. – Back test/Replay/Local SIM: Send Orders to Trade Service is NO, and Trade Simulation Mode on is CHECKED. I trade in my local time zone, not New York – EST/EDT. Is that a problem? Unfortunately it is. Because the S3 and T3 auto traders use studies from multiple charts, and they depend on session times and events based on New York time, all your trading charts need to be on New York time. This is a limitation of Sierra Chart, recently confirmed to be something they don’t plan on changing. Therefore, you will get inaccurate levels, and overlays unless you globally change Sierra to trade in New York Time. This setting is in Global Settings>> Data/Trade Service Settings. 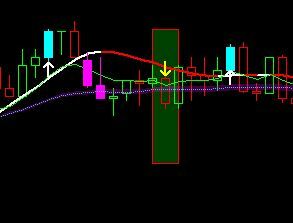 Occasionally on an S3 chart, I will see a bar with no coloring and an auto trade arrow. What is going on? This is an artifact of the small tick size of some futures, like 6E, and the internal accuracy of the color bar study alerts. The arrow is correct, the bar should be magenta. To fix this, open the study ID5 and click on the sub graphs tab. Select Valid Long (SG5) and click Color. Change the color to magenta, (Red=255, Green =0, Blue=255) and click OK. Change the Draw Style to Color Bar. Then select Valid Short (SG6) and click Color. Change the color to cyan (Red=0, Green=255, Blue=255) and click OK. Change the Draw Style to Color Bar. Click OK.
Do you have specific rules of Auto Trading for each indices / assets according to the type of market & the volatility (driven market or range market) ? There are several rules one could follow to improve the success rate of the trading systems. The key is to know when to Auto Trade and when to Sit on Hands. One rule is don’t auto trade near Globex High or Low. I also show how to create buttons to control the auto trading at the global (PC) level, and chart by chart. How are the Auto trading chartbooks installed? The Chartbooks and attached spreadsheet and/or DLL studies are saved in the C:\SierraChart\Data folder, or if you have Transact Futures, they are saved in C:\SierraChart\SierraChartTransActMA\Data.